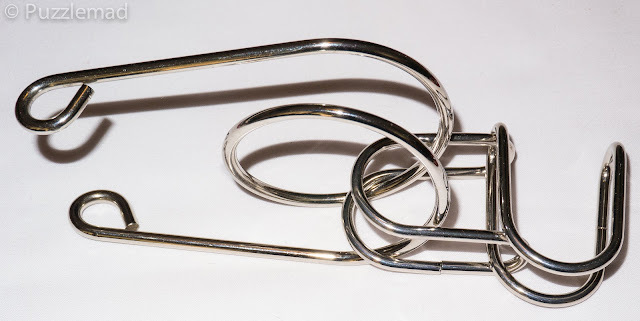 Over the last year, a number of my email conversations with Goetz has ended up with the 2 of us discussing the fact that we often seem to struggle with the reassembly of wire (+/- string) disentanglement puzzles. 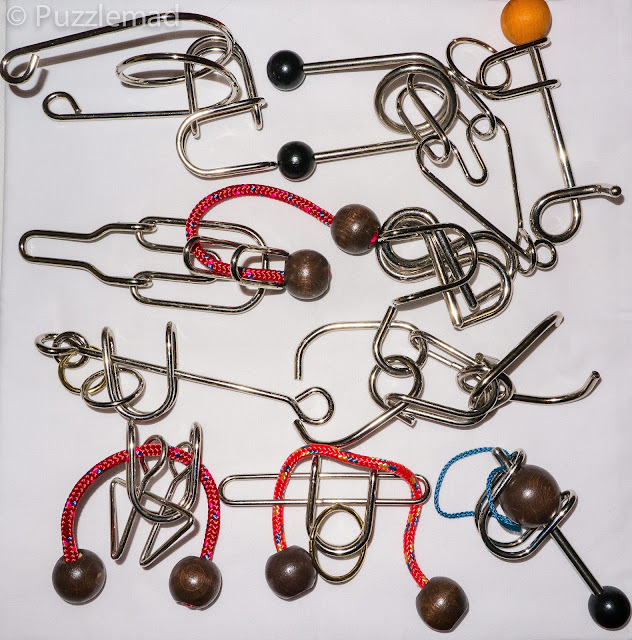 Goetz several times used the term "entanglement puzzle" to describe a puzzle that has more of the challenge when trying to put them back together. We both noticed this phenomenon with a number of the puzzle designs from Aaron Wang and I think that Jean Claude Constantin might well have taken this to another level! The group photo above is a bunch of the recent designs from JCC which he made for my wonderful friend and puzzle pusher, Wil Strijbos. These puzzles are mostly prototypes but if they are enjoyed by the few people Wil has sold them to (including me and Allard) then they will be made available in larger numbers for Wil to sell. I don't have names for them and so have named them in descriptive terms. The one feature they all share in common is the use of the U piece (and sometimes two of them). This U piece is a very interesting topological shape and allows for some incredibly interesting moves - to me, it almost acts like a Möbius strip providing a sort of continuous surface to play with and makes the solution of many of these very tough. They vary considerably in their difficulty level and quite a few of them seem to be very easy to disassemble and VERY tough to put back together - hence, as Goetz has stated before, some of these are better named as "Entanglement puzzles". Needless to say, Mrs S has been distinctly unimpressed at the amount of jingling that has emanated from me in the evenings and also has complained at the creative use of swear words whilst watching TV in the evenings. All of these puzzles are beautifully made out of very heavy gauge anodised steel wire/rods and will stand up to a beating if you should happen to give one to an orthopaedic surgeon. 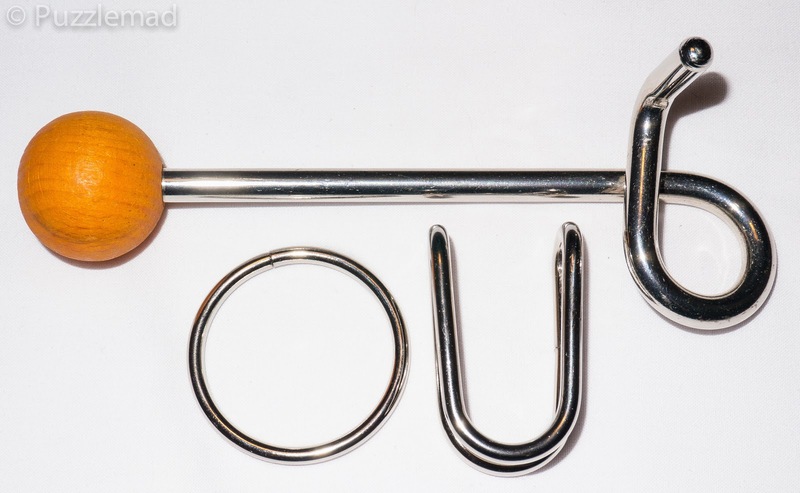 I started with this one (O-U-Rod) and solved it pretty quickly. It is a very nice little sequence of moves that are really quite unexpected but not tough. It took me about 5 minutes to take it apart and after leaving the pieces for a while, about the same to put back together. 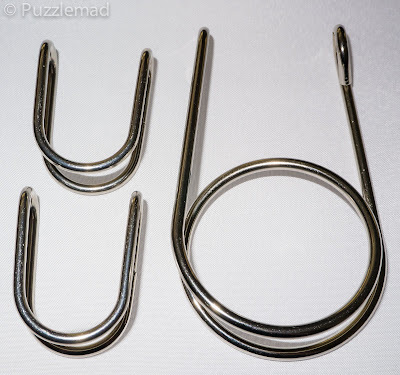 This is a suitable puzzle for a beginner but also good for experienced wire puzzlers because of the unusual moves. I did hope that the rest would be a bit more challenging and I wasn't disappointed! "Always pay attention when taking puzzles apart! Especially when they don't come with solutions". I had these pieces in my hands and only a small idea of the final position when they separated. I laid them down on the sleeping cat and admired my enormous if inadvertent, skills. OK...after 15 minutes, it was time to put it back to the beginning. Except I couldn't do it! The interesting possibilities did lead to an assembly of sorts but the ring and chain were inverted in the U and this was not hard to take back apart. Everything I tried failed and a little panic crept in. Mrs S laughed at me and told me that my "Plug face" was being revealed. In the end, I had to go to bed with this in pieces and come back to it another day! I hate doing that because the longer I leave it the less chance of success. After work the following day, I picked it up and failed many times. It looks so easy and really didn't take long to disassemble! It took the whole evening that day to get it done...PHEW! That is a very sweet puzzle with some very unintuitive moves and a hugely challenging entanglement phase. My goodness! My naming skills are incredible! This was my third puzzle from the batch. It has string. String means danger! 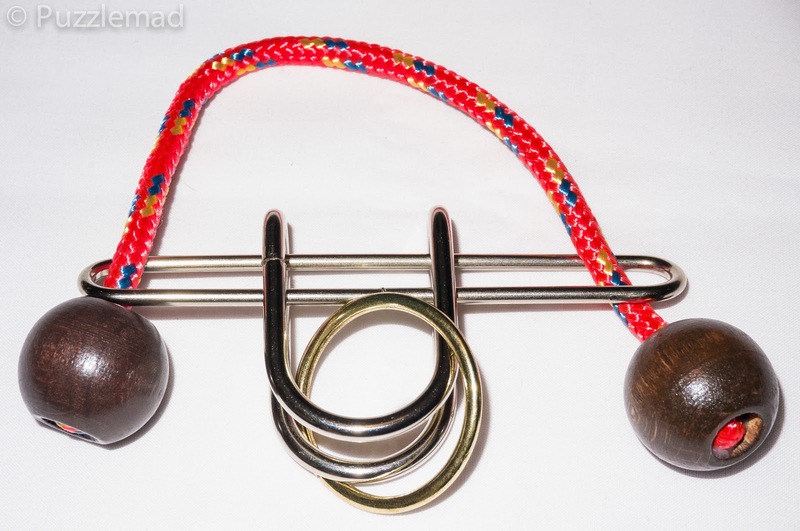 Beware of the string puzzle....it will hurt your head and may even hurt your ego! I have no idea how I did this! The disassembly was slightly longer here but still only about ½ an hour. The reassembly was another matter entirely! There are a LOT of things you can do with these pieces and I think I did ALL of them many times before I had a fantastic Aha! moment. It was ecstasy - only a puzzle but the pleasure and relief I got from putting it back together was incredible. I would suggest this is not for beginners but any decent puzzler will love this one. The final one today is the Spiral-U-U which looks pretty simple but really isn't. I left this one a bit because it is particularly jingly and I didn't want to anger Mrs S any more than I had earlier after Big Steve's latest puzzle arrived (see my New arrivals page) and really pissed her off! The combination of two of the Möbius like U shapes as well as a spiral actually made this one a serious challenge to take apart. It took me a couple of evenings and a good burn from the laser burning stare. As usual, there are a fair number of very subtle moves that need to be done and as usual, I had no idea how it happened. I suddenly had 3 pieces in my hands and yet again no idea how. This puzzle remains in pieces! I have tried to put it back together for several days now and am no further forward than the first time. Very deceptive - it is a medium disentanglement puzzle and a VERY tough entanglement puzzle. I will keep at it but I may end up leaving this in pieces because Wil NEVER EVER gives solutions. Don't even ask for one as it will end badly. I will write about the others in a later blog post and hopefully even solve them all. At least one of the other string puzzles is proving a real challenge to take apart. Which metal (and only metal, no rope) tanglement would you best advise regarding JCC creations, with not a too easy difficulty but not too difficult and interesting moves? This is hard to say as the ones with the string really add to the puzzling when you put a U on it. 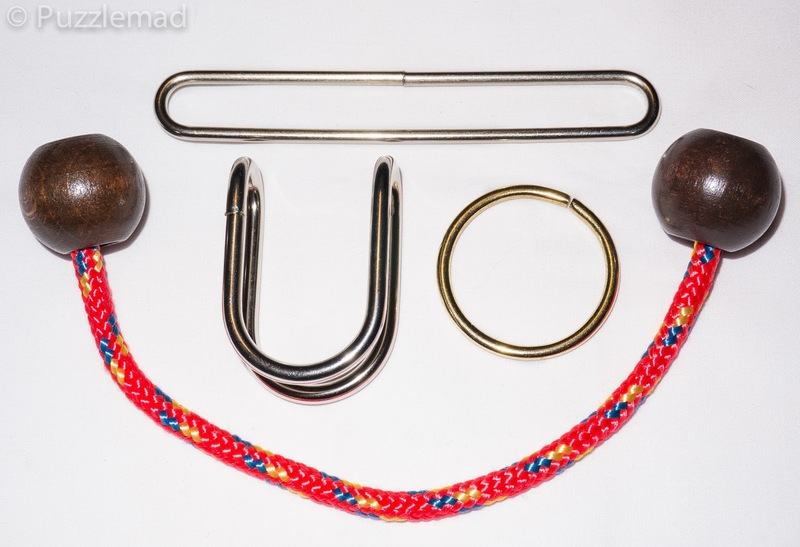 The Rod-Chain-U is great fun and solvable with a little struggle, Spiral-U-U above is very challenging and I have still not assembled it. From a previous review I would also say the two 8U8 puzzles are worth buying.